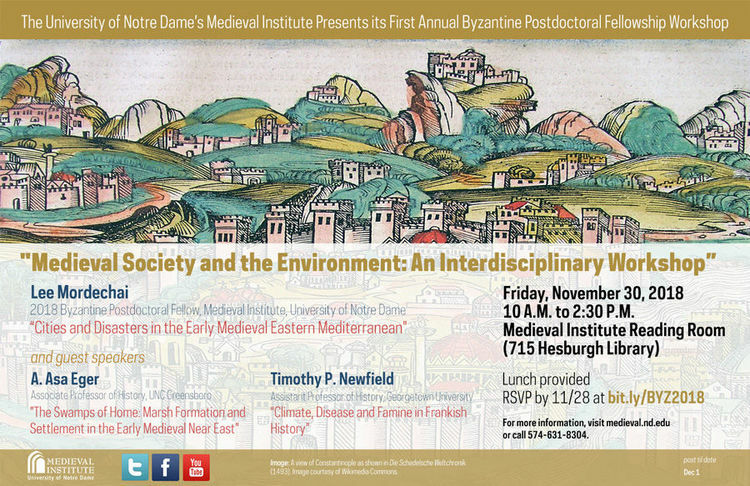 Byzantine Postdoctoral Fellowship Workshop: "Medieval Society and the Environment: An Interdisciplinary Workshop"
As part of its new Byzantine Studies Postdoctoral Fellowship, the Medieval Institute will offer a workshop with each Fellow, organized within the framework of the Byzantine Studies Seminar and treating the fellow’s subject matter. Senior scholars, chosen in cooperation with the Medieval Institute, will be invited for this event and will discuss draft versions of the Fellow’s book manuscript or articles or discuss the further development of ongoing research projects. This year, senior scholars Prof. A. Asa Eger (UNC Greensboro) and Prof. Timothy P. Newfield (Georgetown) will be joining our 2018 Byzantine Fellow, Lee Mordechai, to present their recent research on topics of environmental history in Byzantium and discuss aspects of Mordechai’s project on the Justinian Plague.